It was the first time I’d ever witnessed a steeple-raising in person, and it was amazing. A gigantic crane lifted the massive base and belfry up, up, up above the roof of the lovely chapel at Lanes’ Bend and, with absolute precision, set it into place. Once it was secured, the spire—complete with lightning rod–was attached. Everyone on the ground clapped and cheered. That happened just two weeks ago. Yesterday, Lanes’ Bend officially opened for business as a wedding and event venue. Owned and operated by Andy and Traci Lane, it’s located on seven beautiful acres at 2270 Highway 70 East, less than a mile from I-40’s exit 290. Lanes’ Bend features a 1500-square foot whitewashed board-and-batten chapel and a 3200-square foot covered reception deck that includes a caterer’s kitchen, restrooms, a large dance floor with a breathtaking mountain view and a stage for live musicians or a disc jockey. Also available as part of the wedding package is a sweethearts’ cottage featuring a living/dining room, small kitchen, bridal dressing room and bedroom suite with a large picture window overlooking City Lake. Traci and Andy live just across the driveway from the venue. She once operated a day care out of her home. Andy is a custom cabinet builder at Collins Manufacturing Company, but his expertise goes far beyond cabinetry. 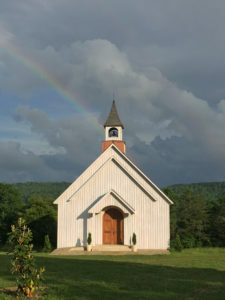 A highly skilled woodworker, he designed and built not only the chapel’s steeple but also the gorgeous arched doors and porch ceiling at the chapel’s entrance. For more information, contact Traci at (931) 265-6423 or find Lanes’ Bend on Facebook.